Start the New Year by doing some good; you can save three lives by donating blood. January is now behind us, and it’s safe to say that your New Year’s Resolutions may have already fallen by the wayside. Maybe you wanted to be more organized, but you’ve still got piles of Christmas presents waiting to be put away. You were going to get up early to go for a run before work, but it’s just so stinking cold out. Don’t feel too bad! There’s plenty of time to get on track with those resolutions, and we’ve got one more for you to add. It’s an easy one – give blood. January was National Blood Donor Month, and in case you’re wondering how to celebrate, well, we’ll make it easy for you – donate blood. Plenty of people come up with reasons not to give blood (ahem, they’re scared of needles), but we’ve got 10 reasons donating blood should be number one on your to-do list this month. It’s Really Needed January is Blood Donor Month for a reason. 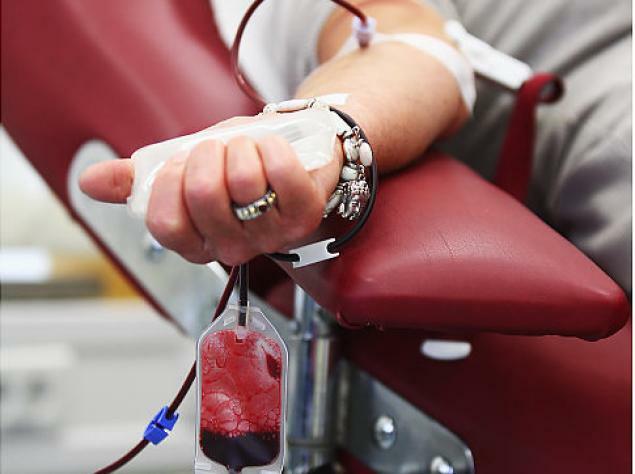 Supplies of blood run low during the winter months, but the demand sure doesn’t. While many blood drives are cancelled due to inclement weather, a blood transfusion is still needed every two seconds. It’s vital to keep blood supplies stocked, which is why this tops our list of 10 reasons “donate blood” should be on your list. Save Three Lives in Under an Hour I mean, really, how many people can say that? But when you donate blood, that’s what you’re doing. The pint of blood you donate will be used to save up to three lives! Free Check-Up When you go to a blood drive, part of the donation process is a mini health screening. A technician checks your cholesterol and blood pressure for free! Donated blood is also checked for conditions such as HIV and hepatitis, and donors are notified of any issues. Put Your Feet Up This may not be an obvious reason why to give blood, but we think it’s valid. In our hectic lifestyles, getting to lay back and relax for a few minutes is a rare treat. You’re also not supposed to do any heavy lifting afterwards, so you have a great excuse to take it easy for the rest of the day. It’s Good For You Obviously the main reason to give blood is to help others, but did you know that blood donation is actually good for the donor as well? According to the American Journal of Epidemiology, blood donors are 88% less likely to suffer a heart attack. This is partly due to the reduction of iron in the body after a donation, which reduces the risk of heart disease. You Get a Sticker If you didn’t get many gold stars in preschool, here’s your chance to make up for it. Everyone who donates gets a sticker that says, “Be Nice To Me, I Gave Blood Today.” So, extra bonus, people have to be nice to you the rest of the day! You Can Make it a Routine Many people don’t realize that you can donate blood every 56 days, and with over 200,000 blood drives held each year, there are plenty of opportunities. By donating as often as you can, you can save as many as 18 lives each year! Easiest Way to Lose Weight Well, ok, by donating a pint of blood, you lose about one pound. And your body works to replace that blood in about 24 hours, so it’s temporary, but hey, a pound is a pound! Be a Hero Superheros don’t all wear capes and tights. 41,000 donations are needed every day, and when you donate blood you give a newborn, a mother, a grandfather, a second chance at life. That’s pretty heroic. The Juice and CookiesNo list of reasons to donate blood would be complete without mentioning this. After donating, you get to take a little snack break to get your blood sugar back up. Many blood drives also provide “swag” like t-shirts and promotional items. So there you have it, 10 reasons “Donate Blood” should top your to-do list in 2016! Contact the Red Cross to find a blood drive near you; and for tips on living a healthy lifestyle, get in touch with us at Wellworks For You!